Used Seat Leon Review - 2005-2012 | What Car? 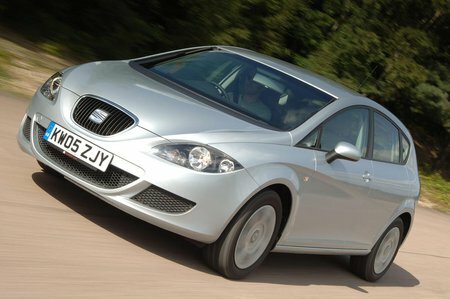 What's the used Seat Leon hatchback like? The Seat Leon looks absolutely gorgeous, thanks to that teardrop, five-door hatchback shape. And, with the underpinnings of the widely acclaimed Volkswagen Golf backing the Leon up, there's substance beneath those seductive looks. Very good though the interior is, don't expect absolute top-notch quality plastics. Visibility isn't great, either, due to thick, sweeping, windscreen pillars. The boot isn't as big as the Volkswagen Golf's or a Ford Focus's, nor is the load aperture as practical. Sitting behind the Leon's small steering wheel on the well bolstered driver's seat, you feel very much as if you're in a sporting car - and it doesn't disappoint you out on the road, either. Although the ride can be a little firm, body control is tight and the handling is tidy and precise, while the engine line-up is impressive, at least for the most part.